Bread is a necessary staple of human life – and yet the ability to make it is relegated to bakeries, stores, and bread machines. Bread typically requires an oven, but in an emergency situation you may not have access to a working oven. Learning how to make emergency bread is a useful skill that could mean the difference between life and death when SHTF. If this is your first time making emergency bread, I recommend trying it on a traditional stove. If you’re ready to experiment, you can use a tin can stove, candle, and non-flammable surface. This recipe makes 10 5-inch tortillas and takes about 40 minutes. 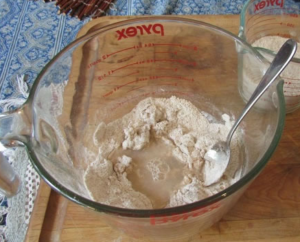 Step 1: Dump most of the flour into the mixing bowl (set a small amount aside to use when rolling dough). Step 2: Gradually add water (while stirring) until flour appears crumbly. Step 3: Knead the dough (with your hands) against the bottom of the mixing bowl for 3-5 minutes (or until dough is smooth). If your dough still feels sticky, add more flour and resume kneading. Step 4: Cover the dough and let sit for 15-30 minutes (this allows the gluten to relax, which will make the rolling process easier). Step 5: Turn on your heat source. Step 6: Divide dough into 8-10 walnut-sized balls. Step 7: Spread flour on your flat surface and, using a rolling pin, flatten each lump into a flat circle (the thinner the dough, the faster it will cook). Step 8: When your pan is adequately hot, flip in your first tortilla. When the edges of the flatbread start to look dry, flip it. When the flipped side starts to bubble, flip it a second time. At this point, your bread should be roiling with bubbles. When the roiling slows, flip it again (should notice more bubbles). Note: With the perfect temperature, all those bubbles will join together into a “pita pocket” bubble. The more bubbles you see, the lighter the flatbread will be. Cover your tortillas with a tea towel to keep them warm and soft.